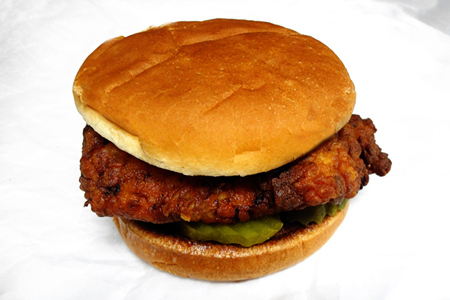 We're all familiar with the original chicken sandwich, right? You know the ones that are served at the really clean, really fast restaurants with a twice-hyphenated name and advertisements that feature grammatically-challenged cows? Yeah, that one! I had my first such sandwich just a little over a month ago, as they've just recently expanded to Boise. I found that, like a certain West coast burger chain with a cult following (also with a twice-hyphenated name), the food and service were great, but it didn't rise to the level of the religious experience espoused by their regulars. And what is it with the dual hyphens? Is that the secret? I digress... Here for your handheld fried poultry enjoyment is my version of said chicken sandwich. Pound the thick end of each chicken breast until the entire breast is of equal thickness, cut each breast in half width-wise and put the pieces in a gallon size zip-top bag. Add the buttermilk, hot sauce and 1 tablespoon of the salt to the bag. Slosh the bag gently to combine all of the ingredients and to coat the chicken completely. Seal the bag while removing as much of the excess air as possible. Place the bag in a lipped pan (to catch any leakage) and refrigerate at least six hours, or overnight. Starting about 30 minutes before you want to serve, heat the oil to 350º in a large heavy skillet (I recommend cast iron). While the oil is heating, combine the flour, powdered sugar, remaining salt, pepper, paprika and cayenne in a medium bowl and mix well. Remove a chicken piece from the buttermilk marinade and shake off the excess. Dredge the chicken in the flour until it is completely covered. Shake off the excess flour and set aside on a platter. Repeat with the remaining chicken pieces. Let the chicken sit at least 10 minutes before frying to ensure that the flour adheres well. Working in batches of two if needed, fry the chicken pieces for 4-6 minutes, or until they are nicely browned and the internal temperature is 160º. Remove the pieces to a wire rack that's placed inside a sheet pan. If you're working in batches, put the sheet pan in a 170º oven. Spread the butter evenly over the cut sides of both halves of each bun and toast under your broiler. Assemble the sandwiches by putting four pickle slices on the bottom half of each bun, add a piece of chicken, and the bun top. Oh, and if you want some of that killer sauce, simply whisk together 1 cup of mayonnaise, 2 tablespoons of your favorite sweet barbecue sauce, 1 tablespoon plain yellow mustard, 1 tablespoon dill pickle juice, 1 tablespoon honey, and 1/2 teaspoon smoked paprika. Done! It makes a lot, but you'll use it, I promise. I really like Chick-fil-A (never been to the other one from CA but I want to try it someday), and I enjoy their chicken sandwiches & nuggets too. I wouldn't quite equate their food to a religious experience, but it is consistently very good and their service is excellent, unlike the largest chain restaurant known for their inconsistent quality and surly employees that I never go to. I thought the secret to their unique flavor profile was brining in dill pickle juice instead of the buttermilk marinade. Any thoughts on this? I'm gonna have to try this - and the sauce sounds down right amazing. Finally got around to pinning this. Can't wait to try, John. Is this a copyright violation ??? Anonymous - I think that you probably mean a trademark violation. No, I don't believe it is. John, I love me some Chik-fil-a. This looks pretty close to the real thing, I will definitely be giving a try! I lived in Atlanta and had one on every corner, now I'm in South Fla and you can't find these as easily. I would love to make a sliders version of this for a party! Maybe not a trademark violation. Certainly seems more than a little unethical. Or is the word crass? Nice john, real nice! I was eager to repin this recipe but because of your derogatory comments about CFA, I won't be. I'd rather go to my local CFA (where my son works) and support them. Paula - I'm sorry, but can you tell me which of my comments were "derogatory"? That looks like a fine chicken sandwich, hyphens or not! Oh my word! Yes, I tried these. And have told everyone I know about them. My sister-in-law tried them and summed it up nicely with "Shut the front door!! These are the real deal!" I love chick-fil-a! But I always love to be able to make something in my own home so I can eliminate preservatives as much as possible. Awesome! Total 10! Anonymous - A guy doesn't get a much better endorsement than that. Thanks for trying the recipe, and for your very kind words.